Nikon caters particularly well for macro photographers, with 40mm, 60mm, 85mm and 200mm options in addition to this 105mm lens. 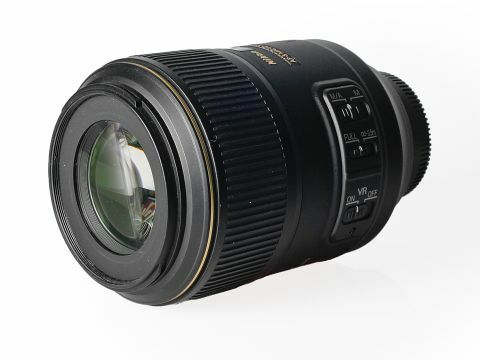 An update to the popular Nikkor 105mm f/2.8D AF Micro optic, the Nikon AF-S VR Micro-Nikkor 105mm f/2.8G IF-ED adds a host of improvements, chief of which being Nikon's second generation Vibration Reduction (VR) system. This, a macro first according to Nikon, uses a compensatory lens group that shifts to counter image blur. It promises a four-stop effect when used as close as 3m away from the subject, which drops to three stops when used at a 1:2 reproduction ratio, and two stops when used at 1:1. Nikon does, however, recommend that Vibration Reduction is turned off when using a tripod. Elsewhere, an internal focusing system enables the lens to constantly maintain the same length, and therefore the same working distance from the subject. This is useful for macro photography in general, but particularly for shooting living subjects such as insects. Internal focusing also means that the front of the lens stays static as the Nikon AF-S VR Micro-Nikkor 105mm f/2.8G IF-ED focuses, enabling filters and other front-mounted accessories to be used without any hassle. Focusing itself is carried out by Nikon's Silent Wave Motor technology, which arrives with the same high speed, low noise promises as the similar technology found in its rival lenses. As with similar systems, it also enables the manual focus ring to be used for fine-tuning, once autofocus has been confirmed. Optically, the lens has 14 elements arranged over 12 groups, with a single ED element among these for the prevention of chromatic aberration. A nine-bladed diaphragm is said to help produce circular bokeh, and Nano Crystal Coating is also used to help minimise flare and maintain image contrast. This works by gradually changing the angle of refraction as the light enters the lens, which helps more to pass through to the sensor rather than be reflected. Next to similar macro lenses, such as Canon EF 100 f/2.8 Macro USM, the lens is fairly bulky, but its 62mm filter thread is a reasonable size and means that you won't need to spend a small fortune should you want to invest in a filter or two. The barrel is finished in the same mottled effect Nikon uses on its DSLRs, and despite being almost entirely plastic on the outside, it feels perfectly solid. A gold ring encircles the front of the barrel, behind which sits a large focusing ring that moves freely enough to be easily operable while not being so slack that it moves out of a set position. The three switches for focusing, focus limit and Vibration Reduction are all clearly labelled and click satisfactorily into position, while their positioning on the barrel enables each to be conveniently flicked back and forth by the thumb as required.